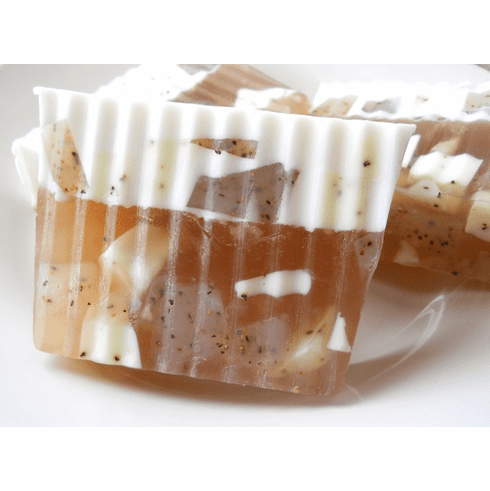 This wonderful Vanilla Bean glycerin soap is infused with notes of French vanilla and vanilla bean and balanced with hints of juicy pear and black pepper. Soap contains a small amount of black pepper for added aesthetics. It contains 100% vegetable glycerin soap that is free of any harsh detergents. Plus, it comes beautifully packaged as a ready-made gift. I also added extra rice bran oil, almond oil, and cocoa butter for extra skin moisture. Weighs approximately 5.5 ounces. Ingredients: 100% vegetable glycerin soap (palm and coconut oil-based), cocoa butter, almond oil, rice bran oil, pepper, fragrance.